Well, here we are with part 2! If you missed the first installment of our garden preparations, check it out here. So the other week, we had a beautiful 75-degree Saturday that we spent clearing out the garden area and building some raised beds. In order to utilize the space that I had set aside, we decided to go with 2 beds… One that is “L” shaped and one that is square (I supposed we could have just done 2 rectangle beds, but clearly my mind doesn’t work that way. Lol Like seriously… I didn’t even think of that until just now). That pallet used to be our herb planter. Now Lambo is using at a window to look for rabbits through. Silly dog. 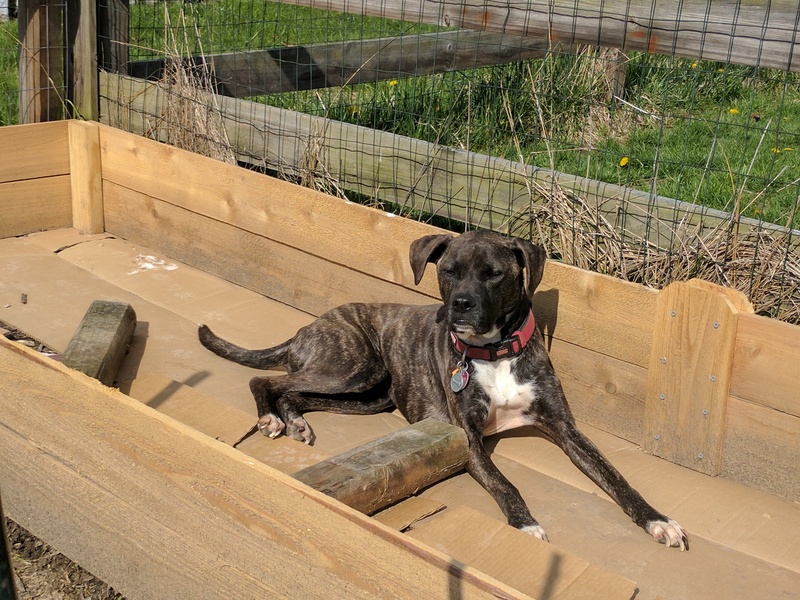 Now, if you are building a raised bed, cedar is the best choice of wood because it is resistant​ to rot and bugs… A good thing to have when it’s sitting out in the elements and filled with dirt. The only problem is… Cedar is expensive! But pine, while usually much cheaper, is more often than not treated with chemicals to make it bug and rot resistant… Not something you want leaching into your garden soil that your vegetables are coming out of. Stripe decided to bust out of the house and come help too. So we leveled the area as best we could, then measured and cut our planks and started assembling them into the boxes. We did have to get a little bit creative on the 8′ sides because the planks were only 6′, but we figured it out. The one downside we had… We forgot to get a cedar 2×4 for the corners. Corner brackets cost way more than we wanted to spend, and we forgot to go back and get the extra lumber before we left the store. And unfortunately, we had somewhere to go that afternoon, so we didn’t have time to go back to the store or we wouldn’t be able to finish building before the lovely Ohio whether turned cold and rainy again. So we did have to settle for some scrap treated pine 2x4s we had laying around in the garage. 😟 Not ideal, I know. Maybe I can convince Handyman Husband to switch them out before we get the boxes filled. Fingers crossed! Anyway… Even though I have used this spot for several plot gardens in the past few years, we still get a lot of weeds coming up. So, from what I’ve read, the best way to stop those from coming up through the bottom of your bed is too put down cardboard. The cardboard serves a few purposes: 1. It keeps weeds from growing up their your beds and stealing all those great nutrients from your plants. 2. It attracts worms. Apparently they love cardboard. And worms are really great for aerating and breaking down waste to feed your soil. 3. Compost. As the worms break down the cardboard, it turns to compost, which puts great nutrients back into the soil. So it’s a win-win-win! We had another decent day this week (kind of chilly, but the sun managed to break through for a while, and it wasn’t raining! ), So we broke down the boxes we had been collecting and spread them in the garden beds. Next time… Dirt! Still not quite sure how we’re going to get it back there, so this could be quite the adventure! Next Post Preparing for Harvest (pt.3)–DIRT!